One of the tasks we undertook in our work within the Ministry of Light Industry's furniture industry R&D Group (1969-72) was studying the use of new materials and new ways of using traditional ones. Such as the plastic cord which, tied to aluminum tube structures, was used for many years to manufacture outdoor furniture. This was a line of work that I assumed personally. Traditionally this material was used as a cheap substitute for other more valuable materials such as textiles or molded plywood. But in our view no material is negligible if the way it is used takes advantage of its possibilities. The use of this material involves a lot of craftsmanship. One of the then prevailing Marxist folklore myths was the rejection of technologies like this, for the sake of an industrialization that time has proved utopian. But it was just this handcraft component that attracted us particularly. At one of the workshops where that kind of outdoor furniture was made we undertook the study of these artisans' craft. As always in Cuba, people there were more than willing to cooperate, initiating us into the small secrets of their trade. Lázaro, the workshop's master weaver had some pretty imaginative ideas he suggested when weaving our first prototypes. In particular, we were interested in the possibility of achieving continuity in the cordage, rather than just having discrete sections for seat and backrest as was usual. After some trials we were able to define a tying-up sequence in which the the sections corresponding to the seat and the backrest intersected. And doing so, to our joy, we obtained optical effects very in tune with those that artists related to Op and Kinetic Art sought. The first prototype was an aluminum tube and red cord chair. 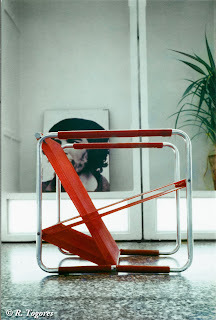 The Red Chair, as I liked to call it, was a cube of 60 centimeters side length composed of two square lateral tube frames that were connected by four straight tubes to which the cord was tied. The cord went from the tube that was to be the upper edge of the backrest to another that touched the ground, from here to the one that supported the seat section at the rear to conclude finally in the seat's front edge. For the tube that rested on the floor the cord's thickness had to be taken into account. Among the several possible solutions, the simplest and most accessible one, as no other materials were involved was coiling the lateral frame's lower section with the same cord. This would require, for the sake of symmetry, to do the same for the top section, which avoided as an added advantage, the arm's contact with the cold metal. For me this design had connotations which clearly related to Russian Constructivism both in the way that the nature of the materials was exploited in its form's genesis as in its dynamism that brought to mind the creations of a Tatlin or a Lissitzky. And as in the works of the Russian Constructivists this chair embodied for me a symbol of revolutionary social dynamics. Nothing more appropriate as its background than Che's photo. Furniture for the Multiflex experimental module, Wajay, 1971. Continuing this research about the use of plastic cord, I considered the possibility of using the its tensile stress as a means for binding the seat's component parts. Instead of metal tubing I proposed myself the use of wood. In those days (1970) the socialist Salvador Allende had just won the presidential elections in Chile, and his plans for favoring Cuba included the supply of large quantities of pine wood, of a quality which was far better than that received from the USSR. Thus was born the Green Chair. A wooden structure of Chilean pine composed by two lateral notched structures where four cylindrical crossbars, also wooden, fitted. The structure is held together by the tied plastic cord's tension. Pine wood and plastic cord chair, 1971. Furniture prototypes using plastic cord. Taller Experimental de Diseño, 1972. Photo: Kuko. Other designs did not reach the prototype stage. One of them that I keep in my personal archives consisted of four wooden columns where the tension of the cordage used as arms and backrest was compensated by a similar one below, resulting in a symmetrical design, a seat that could work upside-down as well. 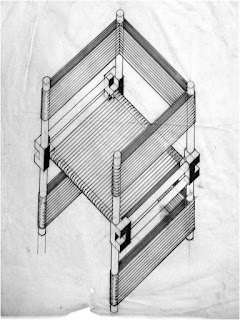 For mass housing plans which require furnishing a large number of houses in a short time, sometimes in very remote places, we had thought about the possibility of manufacturing the metallic or wooden structural elements in centralized factories, in order to send them along with the rolls of cord to those communities where the houses were being built. There craft workshops would be organized, where the elderly, the housewives and the students would produce, using those elements, the furniture in the locality where it would be used. All this work remained as designs and in the best case scenario as prototypes, as unique items. They never reached those for which they were intended, the ordinary Cubans. Perhaps we were mistaken, perhaps those who had it right were the bureaucrats who despised those so unaccustomed shapes? But now, 45 years later, we see that very similar ideas are successful in the international market. A Chilean designer, architect Matías Ruiz Solar has reached a solution very similar to our 1971 Red Chair. Also red. And it is sold worldwide. In our 1971 Cuba something like this was quite impossible. In those times the only alternative for our furniture was to be included in the production plans of the state owned industry. And what was included in those plans was at the discretion of a bureaucracy alien to these refinements of design. For them business as usual was the safe thing. A lifetime has had to pass before designing and producing objects like these for commercial purposes ceased to be outlawed. And we find that in Cuba young people as Miguel Garcés and Luis Ramírez or Raiko Valladares and José Antonio Villa are designing and manufacturing innovative items using the very same technology. Technology that is particularly suited to emerging countries as evidenced by, among others, by the designs of the MAD3 Group in Kuala Lumpur. Traditional aluminum and plastic cord chair. J. 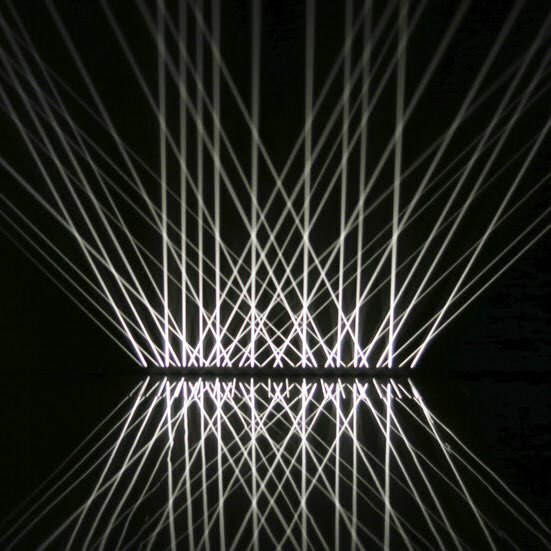 Le Parc, Lumiere alternée, 1966. C. Cruz Díez, Physichromie No. 123, 1964. The Red Chair at the Río Almendares prototype workshop. Tatlin: Monument to the 3rd. International, 1920. El Lissitzky, Lenin tribune, 1920. Above left: M. Ruiz Solar with his M100 chair; right: M. Garcés and L. Ramírez (DeKuba Group). Below left: R. Valladares and J. A. Villa, VIBRA Series; right: D. Phang-Tang M. Kian and B. Chong, MAD3 Group.